I am setting up a traditional circular sawmill. Right now the log carriage is moved by a system that tightens two flat belts that can turn a 12" diameter drum clockwise and counter clockwise. Wrapped around this drum are 6-8 turns of steel cable. It's like a winch where both ends of the cable can pull in opposite directions. The cable then extends in both directions to the ends of the mill tracks, goes through a pulley at each end and then back to the log carriage on top moving it in two directions. I want to get rid of this dangerous flat belt system and move the log carriage with hydraulics. That way I can stand farther than 3ft away from the blade as set up now ( :-0 ). I have drawn a simple schematic and placed it on my pic #6. The red arrows show the cable drum. The cable and log carriage are also shown. I would like to keep the cable and drum and turn the drum with a hydraulic motor and two way valve. I can mount the hydraulic motor directly to the end of the drum's 1" shaft. I'm thinking the valving would be similar to that used on a log splitter so I can turn the drum in both directions. I don't think I'll need super force, maybe 200 lbs at the carriage. 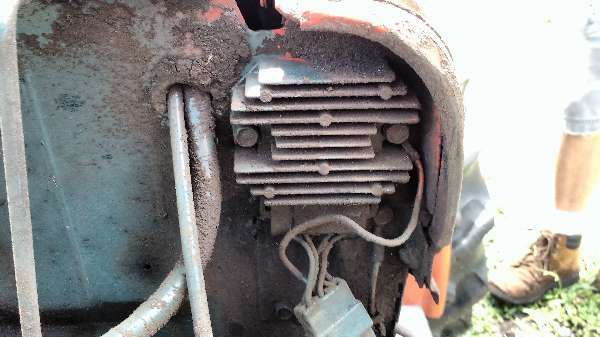 I think my Kubota's hydraulic system should produce much more pressure than I'll need? I have no experience in this but expect that hydraulics will give me no feedback as to the amount of pressure I'm applying against the sawblade which should be limited. Is there a way to control the maximum pressure at or near the valving and yet have good flow below that pressure? If I just constrict the flow of fluid it seems that I can still build up max pressure. I think I'll need about 100 ft lbs of torque from the motor and it should have a range of 0.1 - 1.0 turns per second. This would give me a carriage speed of 3.7 - 37 inches per second. Does this torque and speed sound reasonable for a hydraulic motor? If any of you guys with hydraulic experience could comment, I would appreciate it. Dave, I take a stab at it, I've designed & built several mills over the years, although they were all thin kerf bandsaw mills, not circular blade rigs, the principle should be the same. First of all I'm not sure you are going about things the easiest way with your cable setup, it sounds like a maintenance nightmare, constant fiddling, and potential problems with the multiple passes of cable on the drum. IMHO, the drive might be better accomplished using a pair of 'donut' spare tires run with really low air pressure, to cause a groove or depression in the centerline of the tread, but not with multiple loops of cable around it, the rubber tire should give you more grip than you will need. Besdies this method allows the use of readily available spindles with good bearings (the rear axle of a front-drive car or van is a perfect donor). Tension is obtained, and maintained, by small hyd. cyclinder pushing one spindle out and back as needed. All tension values are determined by a simple pressure gauge in the hydraulic circuit. The higher the pressure, the more the tension. The valve is similar to that used for a splitter, but in the case of a motor they are a little different style. The lever is a rotoating lever, like a hand on a clock, when you move it off the center point and let go it stays there. A "pressure compensated adjustable flow control" is what you want though, it will maintain a set flow rate regardless of variations in the rest of the hydraulic circuit. Again, a pressure gauge will allow you to learn how much force is required, and then be able to repeat it subsequently. Your Kubota will surely provided enough force, but I doubt it will provide the amount of FLOW rate you will need. I would suggest a PTO pump, they have a 1 3/8" 6 spline hole in the center which slips on the output shaft directly. Big volume units are probably in the $500 range. Another option if you have a 2 speed PTO is to make a mount for your 3pth and mount a free-standing pump there and drive it with the PTO at 1,000rpm setting and gear it up to 2,000rpm using a timing chain for a truck motor. As for hyd. motors, they are usually rated in inch/pounds, a pretty big motor is going to make about 4,800 inch/pounds. Twelve inch/pounds is one foot/pound so 4,800 inch/pounds is 400 ft./pounds. However a motor of that size would need about 20GPM at 1,500psi. As I said this is WAY beyond the output of almost any tractor, let alone a CUT. The speed you are looking for is going to be best obtained by gear reducing the motor speed since slow speeds are not great for producing torque, it would be easiest to run the motor at 100 RPM and use a reduction, or change your drive system to accomplish the same thing. Thanks Murf, The drum/winch is already in place from the old setup and actually works pretty well. I'll just be getting rid of the belt system that used to turn it. I think my 3130 puts out almost 9 GPM but that's a long way from 20. The guy I bought my backhoe from had a PTO pump and tank but I couldn't get him to throw it in on the deal. He had mounted the hoe onto his FORD 2N which was way too small for the weight of the hoe. For counterweight he had 500 lbs of weightlifting dumbells hanging with ropes off the front axle and grill. It was a sight to behold! The front end was still floating. I'm getting off track here but I will think about how I might gear a faster motor down. I suppose it will require a parallel shaft. This sounds like a real interesting application that might get me away from my usual theory stuff. I don't have enough time to get my mind around the idea right now and maybe more later if that's useful. For the moment, the site below goes to a set of hydraulic formula that can solve some of the problems. I fish through them later and see what I might solve. If a basic open center system is used there's going to be the problem of controlling flow to control speed. There's also the problem that pressure is developed by the load rather than the pump and the load changes. Off hand, I think there are enough specialty valves to solve the problem. Flow can be proportioned. Different flows and pressures can be created in various parts of a system and I think held constant but it does take specialty valves. It'd be interesting to me to think about it and maybe the results would be useful but it should be kept in mind that I'm an amateur w/o and engineering background. Wish I knew of a web site that describes the various types of valves available. Link: Formula from Precision Power Inc. Thanks Tom, I will look that website over later tonight. I probably didn't discribe the project on the best detail. I should say that the cable winch system is "factory" and was the part of the carriage drive system that works pretty well. It has spiral cuts across the surface that the cable lays in and can wind side to side as it feeds cable to/from the carriage. Now that sound like a real good reason to be away for the Board. Our neighbour usually goes a bit south to where he grew up and brings back deer that feed in corn fields down there. It makes better sausage than our bush fed deer here but any is better than none. Other neighbours went north and brought back four caribou between two of them. Another neighbour went as well haven't heard how he did. Anyway we're likely to be knee deep in caribou sausage around here and it is really out of this world. Oh boy is that stuff (vension included) good! I think Murf is far more up on these sorts of applications than I am, and I may say some really dumb things. I imagine that there are ways other than hydraulic motors for doing things and some may be better applications. I imagine you'll be wanting to run a carriage foreward at a constant slow speed with managed pressure and have a higher reverse speed. I'm not sure if you're thinking of using a variable displacement motor to manage the speed with a constant flow or a fixed displacement motor and manage the flow externally. I think either are feasible. I should reread Murf's comment carefully but I think he pointed out that very slow speeds from motors are not very efficient and I that's true far as I know. The formulas on the site solve for flows required to produce given output HP and required input HP as well. Some overall efficiency assumptions are required. I forget if there are formula that go to torques directly or if you have to do your own conversions. I'd probably start off thinking about it in terms of the force needed on the carriage and required speed to get HP and then work backwards to the motor through any gearing and drive losses. I may see what I can come up with. One advantage of a pto pump is that more of the engine's power can be put into a pump than from most tractor hydraulics. In rereading Murf's comment in detail I see he addressed most everything and far better than I could. There is valving that will manage flow/speed and pressure but getting flow that would produce enough torque directly might be a problem at low rpm's. I'll take a stab at some numbers. If the effort is really butchered than I'll hear about it and that's the way we all learn. If I've got it right, 1HP is moving 550 lbs. in 1 second. So in terms of the carriage, moving 200 lbs. 37" in a second is something under 2 HP, which is a fairly modest requirement. Strictly in terms of flow, 2hp at 1500 lbs. is under 3 gpm. That might seem modest requirement but as Murfs points out, torque is the problem. If 200 lbs. is needed at the outside of the drum, larger torque is needed at the smaller input shaft. Of course, a problem with these formulas is that pressure isn't independent and can't be selected arbitrarily. Pressure is developed by the load and a good question might be what pressure at the pump would develop an acceptable load on the saw blade. I hope this starts an orderly way to think about it in not too many words--for both me and other people. I noted Dennis provided what I think amounts to a 'cyber jail' and I think that's useful. I sometimes think I should have my own category titled something like 'useless ignorant theory groping' for my more self-indulgent efforts. As I say, it's how I learn. Dave, the real problem with running a hydraulic motor is the basis by which they operate requires a minimum amount of flow. They are best explianed as a 'hydraulic water-wheel', the hydraulic flow causes an impeller to spin. The faster (within reason) it spins the more efficient it is. Sort of the wet version of traction, if your vehicles wheels are spinning you have a very inefficient drive, if they connect to the ground there is little loss, the same is true of a hydraulic motor, the impleller must be spinning at the same speed as the hydraulic fluid passing it or there will be BIG losses. I misunderstood the cable setup being 'factory', the norm for this sort of application is a heavy roller chain around the track and fixed to the carriage, the motor then direct-drives it via a sprocket on the output shaft. Tom's effort at the power requirement calculations are close, but they do not include the various losses. In a hydro-static drive system the power losses from heat alone can be substantial, up to 50% is not uncommon. Murf, when I say factory, I'm probably talking about something that was cutting edge for the 1930s or 40s. It's starting to look like the problem is to find the amount of gear reduction that would allow the drum to turn in the speed range I need and yet be in a good range (speed and torque) for an economical ($$$) hydraulic motor. I found one manufacturer’s website (White Hydraulics, link below) that seems pretty informative. For one of their motors (CE120) they show that for a flow rate of 6 gal/min and a pressure of 2000 lbs this motor will produce 1800 in lbs of torque at 173 rpm. I’ll want to run the drum between 6 and 60 rpm (the 6 rpm is probably more important than the 60) and the motor looks like it’s most efficient at between 50 and 400 rpm so it seems that for this motor I would need at least a 10:1 gear reduction. There is nothing special about this motor it was just the first one on their product list. I have no idea yet of the cost.